Astronomers have developed a new computational algorithm that allows them to follow the star formation process down to the very small scales, tracking development of filamentary substructures and secondary clumps as wide as only a few tens of astronomical units. The first stars in the Universe are believed to have formed only a few hundred million years after the big bang, about 13.7 billion years ago. They heated and ionized the pristine intergalactic medium, and their supernova explosions enriched the primordial gas with the first heavy elements (the Universe was born with only hydrogen and a dash of helium). These stars thus altered in a fundamental way the chemical and thermal state of the gas from which the first galaxies then formed, in turn triggering the first self-sustaining cycle of star formation, feedback, and chemical enrichment. Understanding the formation and properties of the first stars is thus an important step towards a comprehensive picture of structure formation in the early Universe. The first stars have yet to be directly observed. They are faint, although future space missions and giant telescopes hope to spot them. Meanwhile, theorists thinking about them have for several decades relied on basic physical concepts and computational simulations. In the current model, hydrogen and dark matter, coupled by gravity, form large structures at the centers of which molecular hydrogen gas forms. Molecular hydrogen can then radiate and cool the structures, allowing them to collapse further and heat up until stars are born. The final stages of the process occur rapidly and inside tiny volumes compared to the whole structure; both of these issues make it very difficult for the computations to track what’s going on. As a result, there are major uncertainties, for example: how fragmentation at the final scale affects the birth weight of the stars produced. 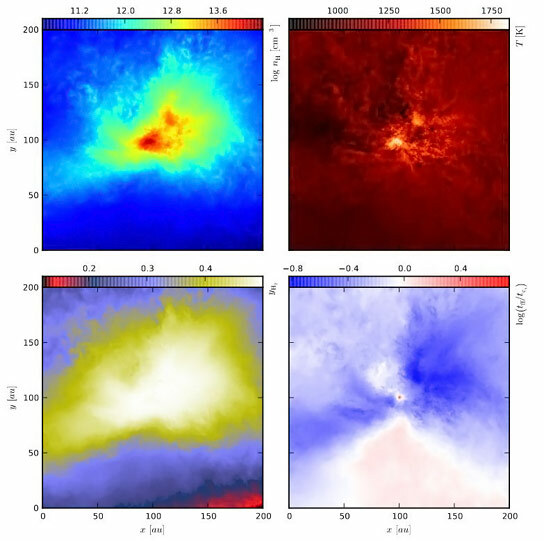 CfA astronomer Thomas Greif and two colleagues have developed a new computational algorithm that can follow the star formation process down to the very small scales. With it, they are able to track the development of filamentary substructures and secondary clumps as wide as only a few tens of astronomical units (one astronomical unit is the average distance of the Earth from the Sun), and to follow whether they form their own stars or recombine; they can also estimate when such fragmentation tends to occur. The new results suggest that not all structures do fragment in the initial stages of collapse. They can stabilize for an interim period but then collapse later, implying that the previously estimated time scale for making some first stars could be longer than previously expected. Be the first to comment on "New Algorithm Allows Astronomers to Track the Process of Star Formation in the Early Universe"